While this revolution is gaining wide acceptance, ARAW, an ecosystem with decentralized payment, based on Ethereum Blockchain, which seeks to increase the implementation of blockchain in everyday life around the world has arrived. Araw platform eliminates the fundamental problems in the economy of e-Commerce and cryptocurrency. The ARAW token acts as more than a simple reward - as it is used and redeemed for all members of the ARAW ecosystem. In addition, owners ARAW may convert their tokens into fiat currency using the mobile wallet ARAW and return cash back to your Bank account. Furthermore, ARAW token will allow regular customers to participate in the rapidly expanding world of cryptocurrency - bringing benefits to all parties involved. The key factors are the ease of acceptance for the client as reward schemes are already common. The ARAW token is a utility based token specifically designed for the global E-commerce marketplace. ARAW token works as unified rewards as well as mode of payments for both online and retail outlets. 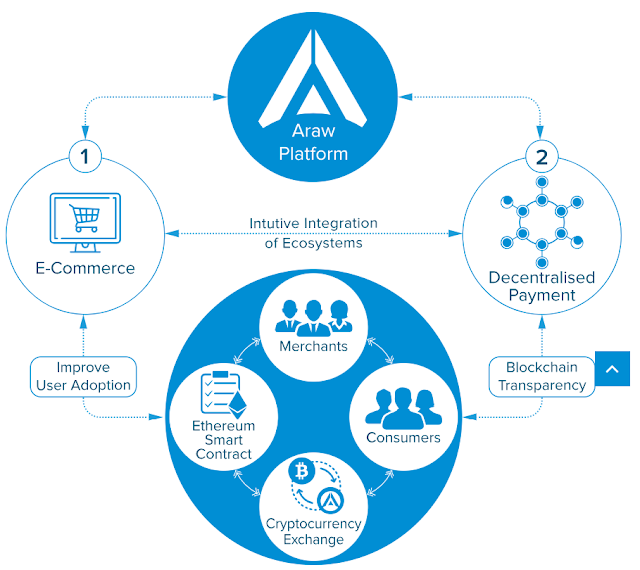 The Araw Platform offers a practical solution to the problems outlined above as well as the potential to become the practical heart of e-commerce and cryptocurrency combined. It strives to reward shopping with cryptocurrency by exposing the common person to the ARAW token. The key focus of ARAW is giving effortless access to cryptocurrency ownership which comes with potential rise in value - without dealing with any of the underlying complexities which make cryptocurrency unattractive. The Unified Reward System seeks to transform the poorly utilised loyalty industry by fusing the shopping reward potential of all retails together regardless of the product - focusing on rewarding the individual with cryptocurrency market access as well as a form of investment. With our technical offering, we seek to support individual sellers as well as enterprise vendors. The ARAW token can be adopted in any location - this global decentralised potential represents virtually limitless growth of the token. This adoption will be seamless as we seek to penetrate e-commerce platforms as well as regular retail shops, without introducing any habitual change from the user perspective. Araw Touch & Pay Card is our single card solution for all reward programmes a shopper may be interested in - the first of its kind in the UK. It allows customers to earn ARAW tokens with their daily purchases as well as pay using accumulated ARAW tokens. This ensures that an average customer can easily adopt the use of the card due to its similarity with existing technologies - but now empowered with ARAW tokens which hold intrinsic value and never expire. This offering allows the ARAW token to have a practical daily use which cryptocurrency has been struggling to fulfill as token value was previously disconnected from its contextual use until now. A lack of a reliable, international exchange which allows individuals to convert tokens into fiat currency. The Araw Platform offers a down to earth solution for the plot of the issue above and also the possibility to wind up the functional heart of internet business and digital money joined. It endeavors to compensate shopping with digital money by uncovering the basic individual to the ARAW token. The key focal point of ARAW is giving easy access to cryptocurrency ownership which comes with potential ascent in esteem - without managing any of the underlying complexities which makes digital currency ugly. Araw Pay will be an open widget to accept payments in ARAW tokens and can be used by any merchants anywhere online just like any other payment gateway providers. We aim to provide seamless Araw pay solutions in Araw mobile & web wallet, open API platform, and Araw e-commerce marketplace. Given our distributed ledger system, items for sale are gathered from different parts of the globe on the marketplace. Buyers and sellers from different parts of the world also come together in a peer-to-peer enabled environment for transactions. Users of the platform can thus have access to the entire list of all the offers available on the Araw marketplace. With our help and the Araw Platform, any shop owner is free to execute a single sale or build an enterprise level e-commerce platform. Araw - Touch & Pay card aims to enable customers to make micropayments at coffee shops, supermarkets and day-to-day online shopping. It contains radio-frequency identification (RFID) to communicate with card reader to enable contactless payments. With the release of Araw Card, we are expecting to raise adoption of the Araw platform by regular customers. With ARAW Token Open API Platform, users do not need to know any form of programming code or language to make use of the system. It is structured to be utilised out of the box. The ARAW mobile wallet continuously connected to Cryptocurrency Exchanges maintains the live exchange rate of the ARAW token and other cryptocurrencies. With seamless banking system integrated in the Araw Platform, Customers will be able to buy ARAW tokens using linked bank accounts. They will also be able to exchange ARAW tokens with fiat and send cashback to linked accounts. The Araw e-marketplace leverages smart contracts to make the process of exchanging goods with ARAW token fast, secure and add trust in the system. It generates secure escrow for two transacting parties. Through this method they are given a money–back guarantee for buyers if the product turns out to be substandard and for the seller, it ensures that the fund for the product they placed on the marketplace is securely transferred to them. The ARAW token platform enables peer-to-peer transaction to give users the chance to engage in direct exchange of goods and services. This enables free trade between two parties anywhere in the world. A seller can sell directly to a buyer across the world without the usual services of middlemen or going through different currency conversions and exchange rate fluctuations. 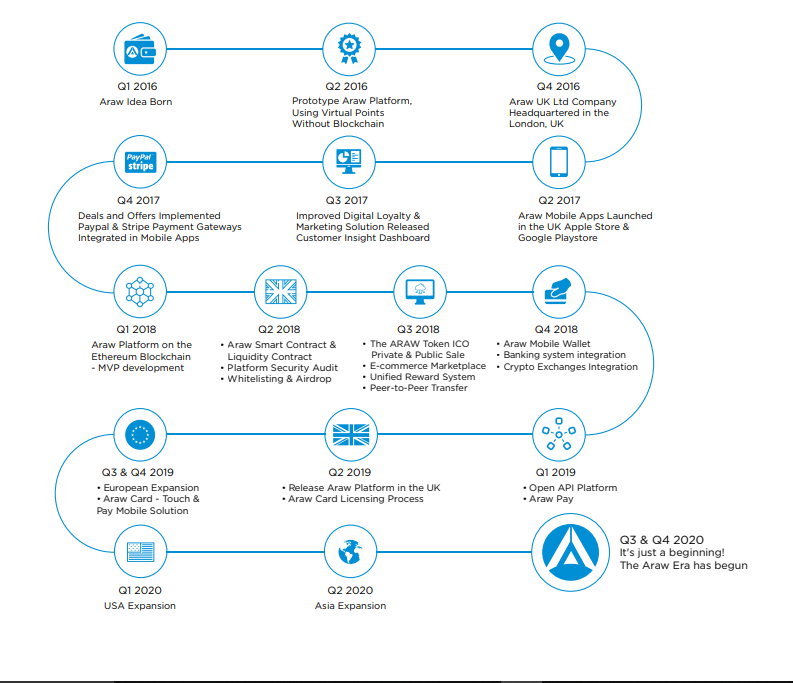 With the various offerings of the ARAW Platform, we are set to unseal the current limitations found in traditional customer loyalty programmes and hasten the development of a more cooperative, unified, and competitive customer reward industry. We aim to replace the traditional restrictive reward points system used by typical commerce companies with a blockchain based dynamic currency that increases participation and interaction between customers and services. ARAW introduces the ARAW token that our customers would use for small payments at gasolene stations, occasional retailers, restaurants, supermarkets and different retailers. This offers them the convenience of payments with ARAW token. that's why, because of the influence of Araw's cryptocurrency, we have a tendency to impose a limiteless scheme in payments and loyalty. The ARAW token is programmed to adopt the safety tips and straightforward access to the ERC20. The ARAW tokens square measure needed for all transactions on the ARAW token platform and represent the reward purpose for all taking part customers or ARAW token holders. for each dealing that's created on the ARAW token platform, whether or not it considerations supply, transfer or exchange, the instigator of the dealing pays atiny low fee for the employment of the ARAW token sensible contracts. All transactions on the e-commerce marketplace square measure usually distributed with the ARAW token, that ought to be transferred via or in Associate in Nursing ERC20-compatible case. ARAW tokens act as medium of exchange for commerce on the platform. It square measure usually used to purchase merchandise or to form settlements. it'll when merely be used to certify that an explicit deal has been completed.